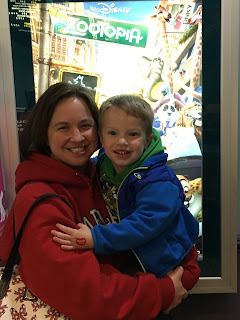 When we headed out to the movie theatre on Sunday afternoon, I'll admit that I wasn't sure how much I was going to enjoy Zootopia. I had heard the story line - small town bunny heads to the big city to make the world a better place. I knew as a Disney movie that it would be good, but frankly I felt like it was also going to be a little "been there, seen that." And I was wrong. I think Zootopia may have one of the best story lines of any animated Disney movie. . .ever. 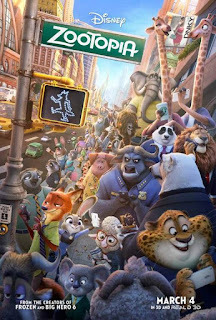 The movie begins with a small town bunny, Judy Hops, who has a big dream to become a police officer in the city of Zootopia. Through her hard work, Judy graduates from the program and heads to city center to take on her new role. Zootopia is a society that says anyone can be what they want to be and predator and prey live together in peace and harmony, or so it seems. Recently, missing mammal cases have been coming into the Zootopia Police Department. But while most cops are working the missing mammal cases, Judy is stuck serving as a "meter maid." It's on the street where she meets Nick - a sly fox. In an unusual turn of events, this unlikely pair will have to work together to find the missing mammals, save Judy's job, and unlock a conspiracy in the city. The writing throughout the movie is clever and enjoyable for adults as well as appropriate for kids. One of my favorite scenes was when Judy and Nick visit the DMV to get information on a vehicle registration. They are in a big hurry, so imagine Judy's shock and horror when she opens up the door and finds the counter manned by sloths. Nick, enjoying every minute of this debacle, encourages the slow work of the sloths by telling jokes along the way. I don't know about your own personal experiences, but there are very few experiences I dread as much as a visit to the DMV; this scene was all too real and very funny! The best part of the movie though is the overall takeaway message. Throughout the movie, characters are implored to see past our own stereotypical opinions and get to know who the real person is beneath the surface. Judy and Nick may seem like total opposites, but once they get to know each other, they find that they have much more in common than they ever imagined. In a larger sense, the whole Zootopia community must learn that they fear and hate can easily divide them, but compassion and understanding are what will ultimately make them stronger. While young children will enjoy the cartoon characters and humor, adults will find the writing witty and the message one that they can reinforce with children of all ages. If you haven't seen Zootopia, plan to head to theaters soon and catch the family fun! OMG- totally agree! We saw it yesterday for the first time and I was blown away!! The message was perfect- especially in light of all we are dealing with in our world today.